But that was two years ago now. Skirmishes between government and separatist forces continued after the elections, and by summer of 2014, towns began to fall once again under separatist control. The National Movement for the Liberation of Azawad (MNLA) and allied groups once again ruled large parts of Mali's sparsely-populated extreme north, where they had declared an independent country in April 2012. Today, the allied separatist forces appear to control much of the region around Kidal, and have proven capable of attacking much farther south in recent months. However, they have gradually backed down from their insistence on full independence, and peace may finally be around the corner. A new agreement offering partially-devolved powers to the north has been signed by the Malian government and two small members of the separatist alliance, with the MNLA and two other major groups saying they too will sign on June 20. The following is a timeline of major events and changes to territorial control since July 2013. 2013.07.01 A new UN peacekeeping mission, the United Nations Multidimensional Integrated Stabilization Mission in Mali (MINUSMA), officially begins. It replaces an early, more hastily-formed multinational force composed of troops from neighboring countries. 2013.07.28 Mali holds the first round of its presidential elections. 2013.08.02 The results of the first round of elections are announced: candidates Soumaila Cisse and Ibrahim Boubacar Keita will advance to the runoff election. 2013.08.11 The runoff presidential election is held, with Keita declared the new president-elect of Mali. 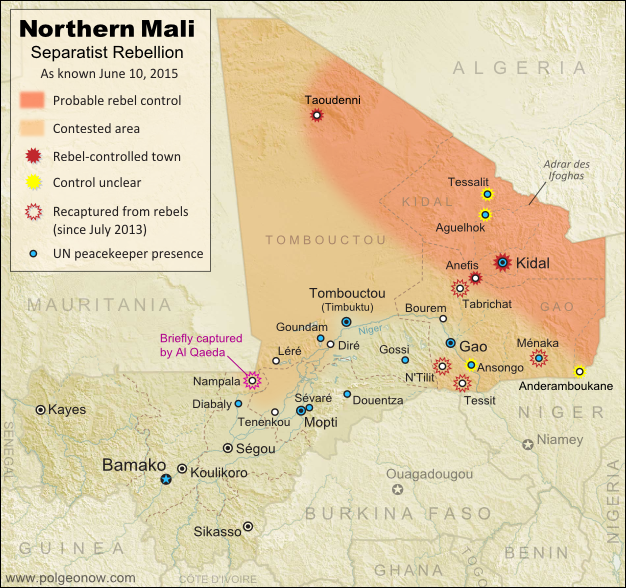 2013.08-2014.05 Regular clashes continue in northern Mali between separatists, pro-government forces, and others, but no reports emerge of rebels capturing territory. 2014.05.20 The town of N'Tilit is occupied by MNLA separatists (source: ACLED). 2014.05.21 A government attempt to assert greater control over the town of Kidal results in a resounding defeat, with separatists seizing the whole city. 2014.05.22 After the capture of Kidal, the MNLA rebels claim they have also taken over Anefis, Aguelhok, Tessalit, Ménaka, Ansongo, Anderamboukane and Léré, though government officials soon deny this. A BBC correspondent "confirms" that the Malian army has withdrawn from Anefis, Aguelhok, Tessalit, and Ménaka. Later events will suggest that Ménaka and Anefis were indeed under rebel control, but that Léré was not. The status of the other towns remains unclear (Tessalit and Aguelhok, though inside the separatist-dominated Kidal region, are also home to contingents of foreign troops). 2014.10.16 N'Tilit is taken from the MNLA by fighters of the Self-Defense Group of Imghad Tuareg and Allies (GATIA), a pro-government, Tuareg-majority militia. 2014.10.18 GATIA and allied militias capture Tessit from the MNLA, which had retreated there after its defeat in N'Tilit. 2014.10.28 At a meeting in Anefis, the three largest separatist groups in Mali's north form a unified military command, called the Coordination of Azawad Movements (CMA). The member groups are the MNLA, the Arab Movement of the Azawad (MAA), and the High Council for the Unity of Azawad (HCUA). The HCUA is a Tuareg-majority group formed largely from former members of Ansar Dine, the group which helped the MNLA take over in 2012, but sought to turn Mali into a religious state until it was defeated during the French intervention. Two smaller groups will later join the CMA as well. 2014.12.26 The MAA, an Arab-majority member group of the CMA, is reported to be in control of Taoudenni, the largest settlement in Mali's vast northwestern desert. 2015.01.05 Fighters from Al Qaeda in the Islamic Maghreb (AQIM) briefly capture a major Malian military base in the central town of Nampala. AQIM has no direct connection to the separatist rebels, but has benefited from chaos in the north. 2015.02.04 GATIA fighters capture Tabrichat from CMA separatist forces. 2015.04.27 MNLA forces are pushed out of Ménaka by GATIA and a pro-government faction of the MAA. 2015.05.14 After internationally-brokered talks in Algeria, CMA separatists agree in principal to a peace deal with Mali's government, which would allow more devolution of power to the northern regions. Two smaller members of the CMA sign the agreement, but the MNLA, MAA, and HCUA say they are not yet ready to sign.